Tens of thousands of foreigners are trying to flee Libya, after clashes between security forces and protesters reportedly left hundreds dead. Egypt has boosted its military near the border and set up field hospitals, as thousands of its nationals return. Several countries are evacuating their citizens and oil companies are relocating expat staff. Correspondents in Tripoli say the capital is calm but there is a sense of intimidation after a night of fighting. The UN Security Council is currently holding a closed session to discuss the crisis. The Arab League will also hold an emergency session. State TV has reported that Libyan leader Col Muammar Gaddafi will address the country later on Tuesday – it said he would announce “major reforms”, but gave no details. Overnight, Col Gaddafi dismissed reports that he had fled amid the unrest sweeping the country, calling foreign news channels “dogs”. Speaking to state TV from outside a ruined building, he said: “I am in Tripoli and not in Venezuela,” after rumours that he had flown to Caracas. Meanwhile, UN human rights chief Navi Pillay said attacks on civilians could amount to crimes against humanity. In a statement, Ms Pillay condemned the “callousness with which Libyan authorities and their hired guns are reportedly shooting live rounds of ammunition at peaceful protesters”. Egypt’s ruling military council said it had sent reinforcements to the main border crossing, the Salum passage, following a withdrawal by Libyan border guards. Around 10,000 Egyptian nationals based in their western neighbour are fleeing the violence. Thousands have already returned from Libya since the protests began almost a week ago. The Egyptian army has set up two field hospitals on the border to deal with the sick and injured. Egypt says it will send at least four aircraft to evacuate its citizens. But Foreign Minister Ahmed Aboul Gheit said the airport at Benghazi had been destroyed and there were problems getting flight permits. “We know there are about one million to 1.5 million Egyptians in Libya, therefore we recommend to our citizens that you stay in your homes, stay off the streets, secure yourselves with water and food,” he said. Meanwhile, unconfirmed media reports said at least 300 foreign construction workers employed by a South Korean company, about 100 of them from Bangladesh, were being held against their will, possibly by protesters, in the eastern port of Darnah. There are about 50,000 Bangladeshis currently working in Libya. Oil company Royal Dutch Shell says all its expatriate staff have been “temporarily relocated”. Italy’s Eni and France’s Total are also evacuating staff. Spain’s Repsol is suspending operations and sending its expatriate staff home. 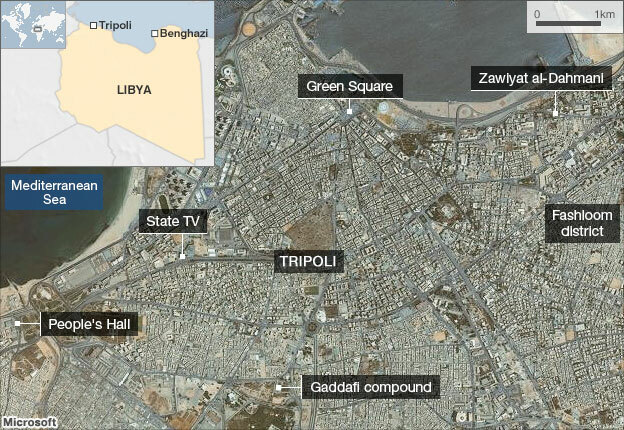 A BBC correspondent in Tripoli says that while there is a heavy police presence in the capital, the second city, Benghazi, is in opposition control and there is no sign of security forces. “People have organised themselves to get order back to the city. They have formed committees to run the city,” said eyewitness Ahmad Bin Tahir. Reports that military aircraft had fired on protesters in Tripoli on Monday have been backed up by Libyan diplomats who have turned against the leadership. But Col Gaddafi’s son Saif al-Islam said the aircraft had been used only to bomb army bases which had defected to the opposition. The BBC’s Jon Leyne, in western Egypt, says the regime now seems to be fighting on multiple fronts, trying to put down the protests and fighting a bitter battle against a growing number of army units that have risen up against the Libyan leader. A growing number of Libyan diplomats around the world have said they are no longer supporting Col Gaddafi. 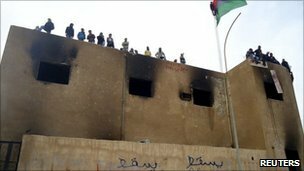 Ali Aujali, Libya’s ambassador to the US, said the Libyan regime was “shaking”. The time had come to “get rid of it”, he told Good Morning America, and urged the US to “raise their voice very strongly”. Meanwhile Libyan state TV denied there had been any massacres, dismissing the reports as “baseless lies” by foreign media. Foreign journalists work under tight restriction in Libya, and much of the information coming from the country is impossible to verify. But the authorities have accepted that eastern cities such as al-Bayda and Benghazi – traditional pockets of resistance to the government – are now under the control of the opposition. Reuters reported that the Libyan side of the Egyptian border was now being controlled by opponents of Col Gaddafi armed with clubs and machine guns who were welcoming people across the border. The unrest did not touch Tripoli until Sunday, when hundreds of protesters flooded the streets, only to be suppressed by security forces. Witnesses say more than 50 people have been killed. Before the unrest spread there, Human Rights Watch estimated that 233 people had been killed. Other groups said the figure was much higher. The violence has helped to push up oil prices to their highest levels since the global financial crisis of 2008. Greece strike turning violent in Athens – Terrible violence as austerity measures develop into unrest. Chilling insight into what may spread into Ireland, Portugal, Spain, France, UK, etc. Squeeze the banks and billionaires, not the people! In Whose Name and Under What Authority! Glenn Beck on Fox News – discussing the New World Order. Has Alex Jones Switched him on at last? Do you have an e-newsletter ?